For as long as I can remember, Jewel&apos;s has been a beacon of cloth and color on the corner of Market and Third in downtown Smithfield. Through rain and sun and snow, the dazzling dresses in the window stand out to pedestrians and motorists like brightly wrapped presents. And without telling my age, the length of my memory is about how long this sophisticated shop has been around. Jewel&apos;s Formals has been in the formal business for 25 years. And they dress each client with a confidence born from over two decades of experience. 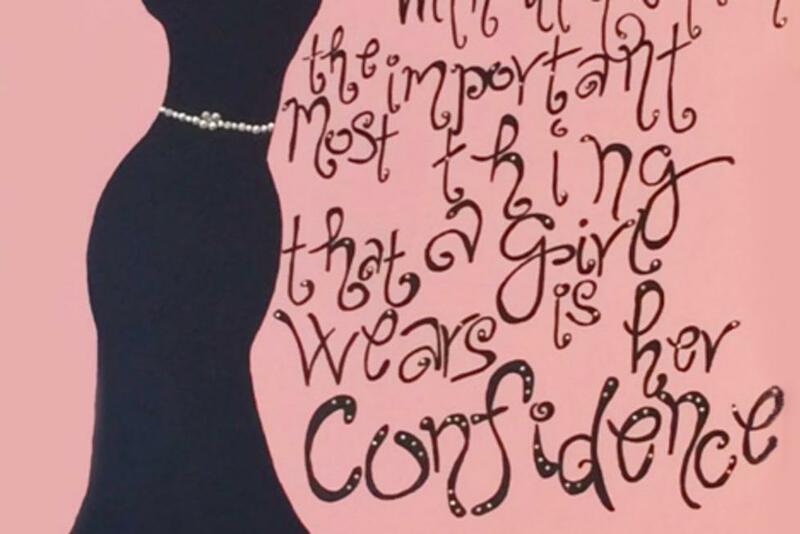 Guarding over the racks of dresses, a canvas mounted on a wall towards the back of the shop says, "without question the most important thing a girl wears is her confidence". With the same thought, Kim Johnson, owner of Jewel&apos;s, would tell you that it is not their service, their dresses, or their hard work that make a dress shine brighter than the rest, it is the woman wearing it. A winning dress does not create beauty, it enhances it. But Jewel&apos;s certainly has winning dresses, or just perhaps winning clients. For the last 2 years in a row, but not for the first time, Jewel&apos;s has dressed both Miss North Carolina and Miss Teen North Carolina. In fact, a staggering estimated 30 girls in this year&apos;s Miss North Carolina pageant wore a Jewel&apos;s dress in the competition, out of 79 contestants. In addition, out of the top 5 Miss Teen North Carolina contestants, 4 of them were wearing a Jewel&apos;s dress in the competition. What exactly does this mean? Well, it means that Jewel&apos;s is a great place to purchase dresses for pageantry. In fact, it is a large part of their business. The second being prom. However, it does not mean that the particular Jewel&apos;s dress worn for the state pageants will also be worn in the Miss America competition. Kim explains that at the national level girls are provided with dress options from pre-selected pageant sponsors. So, Miss North Carolina 2015, Kate Peacock, will not be wearing her winning Jewel&apos;s dress at the Miss America Pageant. But, she may be wearing Jewel&apos;s attire to appearances and other functions. What is important to remember though is that the girl chooses the dress. She selects the shop, the designer, the cut, and the color. Jewel&apos;s has a huge pageant business because an overwhelming number of contestants choose to purchase their dress at Jewel&apos;s. They have a reputation for fashion. A reputation that precedes them. Well-earned over time. And with time comes knowledge of the dress industry and the pageant industry. Jewel&apos;s carries around 25 designer labels at any given time, purchased from different fashion markets twice a year. The shop purchases upcoming fall fashion in the spring and upcoming spring fashion in the fall. 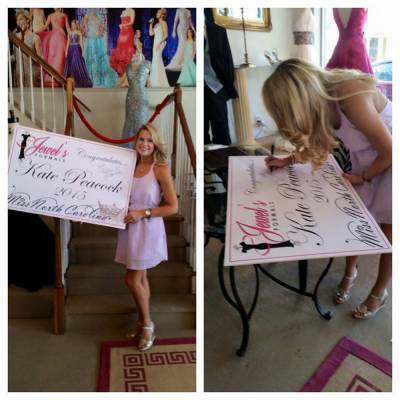 Pageant season runs all year long with preliminaries starting in August and competitions running through May. A contestant could come into the shop at any time of the year looking for "the" dress. Though Jewel&apos;s is not a bridal boutique, they do offer prom, homecoming, military balls, and tuxedo rental expertise. As for pageant knowledge, I learned that Miss North Carolina contestants often go with a safer, more conservative dress - nothing too revealing - and teen contestants have historically stayed away from the colors black and red. However, Kim acknowledged that there is proof in the winner&apos;s circle that this un-written rule seems to be shifting. You can benefit from all this knowledge, plus professional and friendly service at Jewel&apos;s. Even if you aren&apos;t in the market for a pageant dress, Jewel&apos;s will make you feel like a beauty queen for any occasion. And while Kim insists that it isn&apos;t the dress that makes the girl, a Jewel&apos;s dress does certainly make the perfect accessory to any girl&apos;s confidence. Just ask future Miss America (we hope) Kate Peacock!